The Messiah is NOT the cross and the cross is NOT the Messiah. 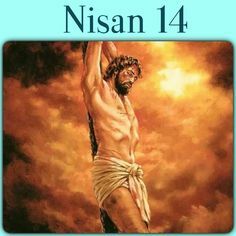 It is a graven image that violates God's 2nd commandment that He specifically prohibits to create or venerate and furthermore It is the cruel and sadistic torture and murder weapon that agonized the Son of God beyond imagination and eventually killed Him. Putting this into perspective, imagine if a loved one of yours was killed by a knife or gun would you wear a miniature version of it on your neck or mount one on your wall as a reminder of your loved one? Of course not - it would be psychotic to do so - then WHY do you think it's proper to wear or hang a symbol of the very murder weapon that tortured and killed the Son of God??? Why would you kneel or pray to the symbol of what was used to torture and kill Him??? Why would you have the symbol of His torture and murder weapon blessed??? Why would you make the 4 pointed sign of the cross on your person??? You are literally paying homage and tribute to the barbaric torture and killing of the Messiah because HE is not a 4 pointed symbol. No such thing to do this or carry this satanic relic is found in the Bible - the Evil One has deceived you in the worst way. Do not let anyone deceive you and no matter how much you're in denial, the above is TRUE and the FACTS. Do the right thing - throw whatever crosses you have as jewelry or mounted on walls away immediately into the nearest trash or waste bin where they belong. If "Pope" John Paul II was given "sainthood" for vague connections to two individuals "cured" of an ailment, should not his "sainthood" be cancelled for the death of an individual attributed to a cross dedicated to him? STRONGS NT 4716: σταυρός "THE ENGLISH TRANSLATION OF CROSS"
1. an upright stake, especially a pointed one (Homer,Herodotus, Thucydides, Xenophon). STRONGS NT 4717: σταυρόω "THE ENGLISH TRANSLATION OF CRUCIFY"
1. to stake, drive down stakes: Thucydides 7, 25, 6 (here οἱΣυρακοσιοι ἐσταύρωσαν, which the Scholiast rendersσταυρους κατέπηξαν). The STAUROS of the New Testament: Cross or Stake? What was its form in the case of Jesus Christ? Was it a two-beamed cross or a simple upright stake? Was wood scarce in and around Jerusalem at the time and does this have any bearing on what method the Romans used in Jesus' case? What does the Greek word mean? Are there scriptures that 'point' to its form? What weight should be given to post-N.T christian writers? Can archaeological findings, such as supposed 1st century christian inscriptions, be of help? Has the New World Translation's choice been critiqued fairly? Is the New World Translation alone in its preferred rendering? Whatever form it was should we have it as a symbol in our places of worship or cherish, hold as dear, the implement of Christ's death? The word "stauros" occurs 27 times in the Christian Greek Scriptures(the 'New Testament'). This word has been consistently translated in the New World Translation as "torture stake" and never as "cross". It is the implement on which Jesus Christ was afixed and executed. Also, another Greek word was used by the Bible writers "xylon", as the same implement of execution in regard to Jesus, which denotes, "wood, a piece of wood, anything made of wood..."-Vine. At those places where "xylon" is used in connection with Jesus' execution the New World Translation has rendered it as "stake". Is there any justification for the New World Translation to do this with these Greek words? "STAUROS....denotes, primarily, an upright pale or stake. On such malefactors ware nailed for execution. Both the noun and the verb stauroo, to fasten to a stake or pale, are originally to be distinguished from the ecclesiastical form of a two beamed cross. The shape of the latter had it's origin in ancient Chaldea, and was used of the symbol of of the god Tammaz (being in the shape of the mystic Tau, the initial of his name in that country and adjacent lands, including Egypt. By the middle of the 3rd cent. A.D. the churches had either departed from, or had travestied, certain doctrines of the Christian faith. In order to increase the prestige of the apostate ecclesiastical system pagans were received into the churches apart from regeneration of faith, and were permitted largely to retain their pagan signs and symbols. Hence the Tau or T, in it's most frequent form, with the cross-piece lowered, was adopted to stand for the cross of Christ"
The Classic Greek Dictionary, Greek-English and English-Greek, With an Appendix of Proper and Geographical Names prepared by George Ricker Berry reads under "stauros": "..an upright pale, stake or pole; in plu. a palisade. II. the Cross.(p.648). Although this lexicon seems to give "the Cross" as a meaning for "stauros" it seems rather as a reference than a meaning ("the Cross" rather than "a cross") and to that of Jesus Christ. Hence definition II is somewhat 'suspect' and may only reflect the lexicons belief that the stauros in the NT was cross-shaped or it may be giving it as a reference, that is, that when we read in the English Bibles "cross" this is from the Greek stauros and no indication it was actually cross-shaped. In its definition 1 though there is no doubt the meaning of stauros and anything other than that stauros meant more than one piece of wood, whether it was a "pale, stake or pole" is not mentioned and certainly none of which were 'cross-shaped.' This is its meaning in all the Greek classics such as Homer. There is no evidence that the from or shape of the stauros in Jesus Christ's case was any different. "2.XULON.....(b) of the Cross, the tree being the stauros, the upright pale or stake to which the Romans nailed those who were to be executed, Acts 5:30; 10:39; 13:29; Gal.3:13; 1 Pet.2:24;"
According to a Greek-English lexicon by Liddell and Scott, this word means "Wood cut and ready for use, firewood, timber, etc. . . . piece of wood, log, beam, post . . . cudgel, club . . . stake on which criminals were impaled . . . of live wood, tree." "wood . . . " Hence in the Authorized Version/King James Version this word is rendered as "tree" at Acts 5:30. The Complete Jewish Bible by D. Stern has here "stake." See also Acts 13:29; Galatians 3:13; 1 Peter 2:24. "On "torture stake," again, I think that the NWT is a bit heavy handed in trying to make a point. Certainly "stake" would be sufficient, and more desirable. The JW's are trying to shock Christians away from their devotion to the cross. It is, after all, an instrument of execution. They are right that STAUROS does not necessarily mean the cross form as Christianity has thought of it. It can be just a plain stake in the ground to which someone is nailed. But I think "torture" is too much and misses the point: it is meant to be a form of execution and not torture. "In the Greek N.T. two words are used for "the cross", on which the Lord was put to death.1. The word stauros; which denotes an upright pale or stake, to which the criminals were nailed for execution. 2. The word xulon, which generally denotes a piece of a dead log of wood, or timber, for fuel or for any other purpose. It is not like dendron, which is used of a living, or green tree, as in Matt.21: 8; Rev.7: 1, 3; 8:7; 9: 4, &c. As this latter word xulon is used for the former stauros it shows us the meaning of each is exactly the same. The verb stauroo means to drive stakes. Our English word "cross" is the translation of the Latin crux; but the Greek stauros no more means a crux than the word "stick" means a "crutch". Homer uses the word stauros of an ordinary pole or stake, or a simple piece of timber. [ftnote, Iliad xxiv.453.Odyssey xiv.11] And this is the meaning and usage of the word throughout the Greek classics. [ftnote, eg.Thucydides iv.90. Xenophon, Anabasis v.2.21] It never means two pieces of timber placed across one another at any angle, but of always one piece alone. Hence the use of the word xulon(No.2 above)in connection with the manner of our Lord's death and rendered "tree" in Acts 5:30; 10:39; 13:29; Gal.3:13, 1 Pet.2:24. This is preserved in our old English name rood orrod. See Encycl.Brit., 11th (Camb)ed., vol.7, p.505d. There is nothing in the Greek of the N.T. even to imply two pieces of timber." "Used here[cross] for the stauros on which Jesus was crucified. Both words[stauros, xylon]disagree with the modern idea of a cross, with which we have become familiarized by pictures. The stauros was simply an upright pale or stake to which the Romans nailed those who were thus said to be crucified. Stauroo[the verb], merely to drive stakes. It never means two pieces of wood joining each other at any angle. Even the Latin word crux means a mere stake." "stauros STANDer: cross, an upright stake or pole, without any crosspiece, now, popularly, cross..."
"stauroo cause-STAND, crucify, drive a stake into the ground, fasten on a stake, impale, now by popular usage, crucify, though there was no crosspiece. "- pp. 63, 64, Greek-English Keyword Concordance, Concordant Publishing Concern, 1983, 3rd printing of 6th edition of 1976. To read what an issue of The Watchtower magazine wrote in 1950 when the New World Translation of the Christian Greek Scriptures was published see here. The Shroud is a 14ft (4.3 metre) long piece of linen that appears to show the faint imprint of a man bearing wounds consistent with crucifixion. Some people believe it shows the image of Jesus of Nazareth, while others think it is a medieval forgery of cloth wrapped around a body after crucifixion.The Shroud is the most studied artefact in human history but its age remains in dispute. Radiocarbon dating of the cloth carried out by the University of Oxford in 1998 found it was only 728 years old. Regardless of whether the Shroud is Biblical or medieval, Matteo Borrini at Liverpool John Moores University told New Scientist that ‘it’s a very interesting piece of art and human ingenuity’. piece of art and human ingenuity’. 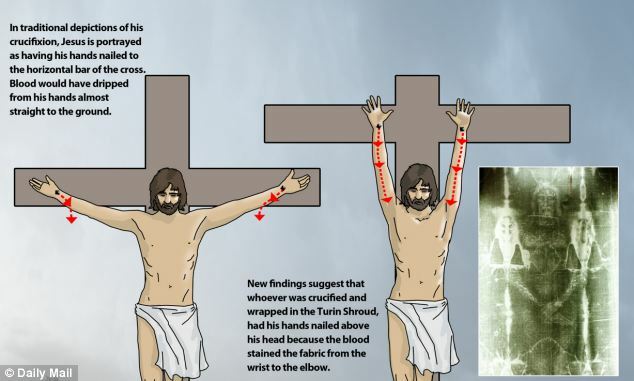 He set out to find whether the ‘bloodstains’ on the left arm matched up with the flow of blood from a crucified person. 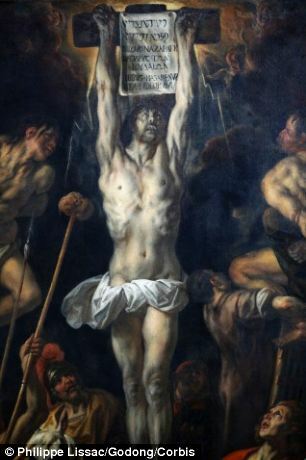 To investigate, another researcher from the University of Pavia, Italy, assumed different crucifixion poses while donated blood trickled down his arm from a place where the shroud shows a nail was hammered through the hand. The duo found that the ‘blood’ marks on the shroud correspond to a crucifixion – but only if a person was nailed onto a cross in a ‘Y’ position instead of a ‘T’ position, as depicted in most Christian art. The scientists set out to find whether the 'bloodstains' on the Turin Shroud flow of blood from a crucified person. By safely simulating different positions of crucifixion they worked out that the man wrapped in the legendary cloth must have been crucified in a Y-shape position, pictured right. Does it make a difference how the Messiah was executed? Absolutely... the truth sets you free of false, established paradigms that would have you believe there is salvation in a pagan Egyptian symbol - the Tau - which expressly violates the Father's 2nd commandment to NOT worship false images. Given Roman Catholicism's obsession with pagan worship - particularly Egyptian - it is not surprising it would adopt and sell an instrument of death for salvation.